When it comes to shopping for traditional wedding invitations, you're probably thinking "what makes a wedding invitation traditional?" A few different factors go into a traditional wedding invitation but two big factors are the design and the wording you choose. What do traditional wedding invitations look like? Foil stamping - foil stamping is incredibly popular right now in all kinds of colors. Pearl foil is more of a classic, understated look that's very elegant and pretty. You will find many patterns that are foil stamped and embossed for a look that's absolutely stunning. Letterpress printing - letterpress was developed hundreds of years ago and it's so beautiful that it's still used today in the most refined of wedding invitations. Wording and design are heavily impressed into thick paper, which leaves the design and wording crisp and sharp. Layers - layers add depth to the invitation while often remaining clean and simple, which draws attention to your wording. Symbolism - many couples who want a traditional look also want to see a sense of symbolism in the invitation. Symbols that represent love and faith like wedding rings, hearts and crosses are beautiful choices. 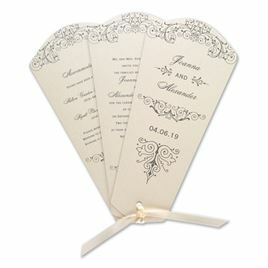 Embellishments - embellishments are essentially accents that add a beautiful finishing touch to the invitation. 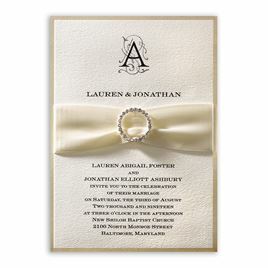 Things like satin ribbons and ornate wraps add a special something that is sure to impress recipients. 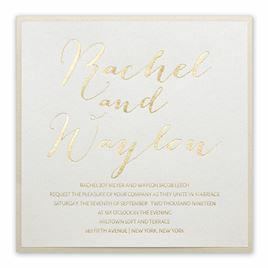 What kind of wording goes on a traditional wedding invitation? Traditional invitations tend to be for more formal weddings, which means you'll want to write more formal wedding invitation wording. This can feel like a daunting task because there are so many etiquette rules to follow when writing formal wording but we can help step you through it! 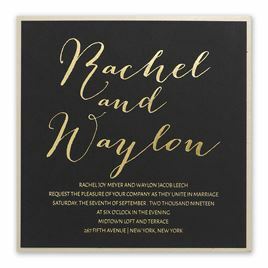 We suggest reading How to Word Your Wedding Invitations: Formally or Informally.